These pancakes are gluten free, grain free, dairy free, and vegan.With these pancakes, every morning can feel like a special occasion. 4. Pour about 2 tablespoons of the batter at a time into the skillet and cook until the bottom appears set (1 to 2 minutes). Flip with a spatula and cook another minute on the other side. 5. Set cooked cakes aside on a plate. 6. Serve topped with sliced bananas and a drizzle of maple syrup. 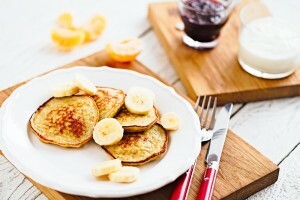 How did your banana pancakes turn out? Let us know in the comments below! For more delicious detox recipes and expert guidance navigating your detox experience, join Dr. Colbert’s 21-Day Detox for FREE today!